When it comes to keeping your mind, body and spirit finely tuned, there’s perhaps nothing that deals with all three quite as well as yoga. It can help you deal with long journey-related circulation problems, improve the quality of your sleep and even help your soul bond with other travellers as you participate together. We know of a ton of hostels that offer yoga as part of the travelling experience, and once you try it, it’s not hard to see why. Treating this one separately to just plain exercising, mostly because hiking really is its own beast. Along with the obvious muscular and stamina benefits, there is something soothing to the mind and soul that comes from communing with nature. Just TRY and be stressed after a scenic hike up to a breath-taking view. Impossible! Sometimes you’ve just got to get DIRTY! Some choose the natural salt spa of the Dead Sea, while others prefer swimming in a Colombian mud volcano. Whatever your preference, make sure you let Mother Nature give your pores a boost. Taking care of your body is massively important, but so is nurturing your spirit. Many travellers talk about their backpacking adventures leading to spiritual awakenings and a new perspective on their place in the universe. Whatever your spiritual leanings are, take some time to explore the world around you, and the deeper meanings of your place under the stars. A quick and easy way to give your mind and soul a little boost is to detox from the digital world. Anyone who has travelled in less developed countries will testify that some of the happiest people in the world are those with a lot fewer possessions than us lucky travellers. Stepping back from the 0’s and 1’s is often key to a mental makeover while travelling. It’s impossible to underestimate how important it is to get enough sleep while travelling. Unless you’re on a whirlwind city break, most backpacking is a marathon rather than a sprint. Pick a hostel that’s all sorts of comfy, and recharge your batteries. Your mind, body and spirit will thank you. Part of taking care of your spirit is enjoying yourself. Seriously, live a little! Travelling will change your life, and part of that process means experiencing the wonders of the world. Don’t be afraid to be a little selfish and reward your psyche with a well-earned treat after a hard day’s adventuring. For amazing foodie experiences that let you meet new people while travelling, check out our friends Vizeat! Travel has a wonderful aura of spontaneity about it. But that same spirit often can mess up our daily routine. Make sure to do a little planning ahead of time, anticipating the every-changing nature of backpacking so that you have a solid routine for daily living. Keeping up with some sort of routine will help regulate your body and mind, keeping yourself relatively more stress-free and available for adventure-having! You’ve just got to stay hydrated. It sounds simple but it’s scary how quickly health on the road can take a turn for the worse when it’s all sun and sweat and no agua! Take some water purification tablets with you if you’re worried about the local water quality. Carry a reusable bottle with you. Just make sure you get that H2O! We know, we know. Backpackers LOVE a good party. Often hostel bars are at the centre of some of the most epic nights out. Just let your liver breathe a little, and make sure you don’t drink so much that you don’t even remember your trip! Don’t overwhelm yourself and spend your entire trip stressed. Chill out a little. Give your mind some “me” time. Leave some room each day for spontaneous adventures to spring up. Don’t try and see every little thing and do every single activity. You’ll get burned out, and your spirit will be burdened. Don’t file this one away in the “obvious” drawer. Yes of course many of your adventures will be strenuous. But if you’re not off climbing mountains and exploring vast cities on foot, make sure you build a little time into your day to break a sweat. Sometimes the thing your mind, body and spirit really need is a good old-fashioned endorphin rush. Along the same lines, try your best to walk as much as you can. It may sound like a no brainer but you’d be surprised how easy it is to keep your metabolism moving and your mind in a state of Zen just by walking. City breaks make it pretty easy to get your stroll on, but it’s also definitely doable in more remote locations. Do your research, take your time, and walk. Part of keeping your spirit healthy is learning to love yourself. Of course this doesn’t only happen while travelling, but there’s something about the open road and adventure that lends itself to soul edifying and self-discovery. Along your journey you’ll have ample opportunities to develop a healthy love of who you are as a person. Embrace those chances like your health depends on them, because they partly do. Another soul healing thing that makes travel so incredible is its ability to open our minds and hearts. Learning about other cultures and experiencing them first hand destroys prejudices and brings peace to the mind. Part of being healthy means developing an ever deepening healthy view of the world. One of the first nutritional groups to suffer from travel-induced neglect is fibre. Don’t find yourself in a prickly situation on the road…internal plumbing-wise. Staying healthy means staying active, and that’s just as true for your mind as it is for your body. Keep reading. Keep learning. Don’t let your search for knowledge grow apathetic on the road, as a sharp and healthy mind will only help you navigate through life’s challenges. It can be easy to take sanitation for granted in some parts of the world, but no matter where you are, you’ll stay so much healthier by keeping clean. Wash those hands! Wash your clothes! Avoid dodgy food situations. Take hand sanitizer with you. Protect yourself from pesky and preventable bugs that are hell bent on impeding your trip. Cleanse your heart, your skin, your lungs, and your emotions with as much fresh air as you can. Experience the beauty of the natural world no matter where you are visiting. Even some of the biggest and most popular cities on Earth have some secret green havens. For many travellers, solo travel is a life changing experience. But you don’t have to be a seasoned nomad to know that even for the biggest extroverts, some alone time is soothing for the soul. Clear your mind, go at your own pace and even exercise without fear of judgement through some planned alone time, even if you’re travelling with buddies. Travel unburdens your soul, but make sure not to burden your body. When it really comes down to it, you probably won’t need to bring anywhere close to the amount of stuff you think you’ll need. Pack light. Shed the pounds of luggage that’ll cramp your muscles and your style. You’ll feel the relief in your back, shoulders and psyche. Emotional health is so closely linked to physical well being. Don’t short change your deepest selves! Take some time to write. Write about your adventures, your feelings and your hardships. Write to loved ones back home, or to travel buddies you met along the way. Start a blog and publish your hard-earned travel tips. Unnecessary stress is a poison. It has many mental and emotional side effects, as well as physically taking a toll on one’s muscles, nerves, joints and even vital organs. Many travellers across the world find it helpful to meditate to channel some inner peace into their weary bones and tissues. Mental health is vital. Almost nothing will derail an incredible adventure more destructively than insecurity surrounding volatile relationships back home. Don’t let those who don’t understand your need to travel exhaust your heart – you’ll need it to fill with memories from your adventures. Another simple one but it’s so important! Especially while journeying in less developed countries and while venturing out of the city, know your first aid. Being able to calmly and quickly assess a situation and work to fix it could maybe even mean the difference between life and death. Heaven forbid an unfortunate situation actually arise, but be prepared! Safety is certainly not uniformly standard across all countries and destinations. Make sure you know the environment of the place you’re going to, and prepare accordingly. Be vigilant and alert, making sure you aren’t caught off guard. The world is a lot safer than non-travellers think, but safety partly comes from being sensible and vigilant. Wanderers all over the world are just brimming with great advice on how to stay healthy. Listen to them! 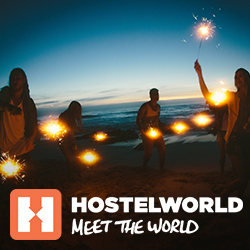 Half the people in your hostel will have stories and tips to share. Some of the best advice on any travel subject you will ever hear is found in the dorms and social spaces of backpacker hostels. Don’t be stingy with the vitamin D! The sun literally gives us life. Going out of your way to be surrounded by as much natural light as possible on your travels will rejuvenate your soul, and energise your cells. Using coconut oil is a really easy and travel-friendly way to keep your skin feeling nourished and fresh while on the road. With a little ingenuity you can turn your hostel room into your own little spa. Open. Those. Pores. Seriously, skin can be so fragile, and the last thing you want to deal with on your sojourn is where to track down some ointment. Steam it up and stay smooth! I’m sure science will back us up on this one. Creativity is the mind, body and spirit’s way of expressing feelings, emotions, passions and ideas. We need to express such feelings in order to release the mental and emotional pressure that builds up over time. One of the best things you can do for your health is to express your creativity through art, music, photography, writing, or whatever your chosen form may be. For beautiful prints of your best travel shots check out our friends at Super Snaps and get your scrapbooking game on! Getting enough sleep is important, but part of achieving that goal means that sometimes you’re going to have to catch some shut eye in unusual places. You may have a snoring dorm mate, or have to travel all night to keep on schedule. But the art of sleeping anyway, especially on crowded buses and airport chairs is a necessary one, and all part of the magic of travel. It’s 2017, and that means if you’re looking for healthy food options, chances are you’ll be able to find something that tickles your fancy. A common passion point amongst many travellers is their love of vegan food. It’s healthy, delicious and so easy to find. You might even consider journeying to a particularly vegan-friendly destination to make sure your options are maximized, like NYC! Protect yourself in case of emergency. The last thing you want is to be stuck in a foreign country without access to affordable and reliable healthcare. It’s one of those things that you feel might be a waste, until you desperately need it. Just do it! K? We all love a good tan, but there is such a thing as too much sun. It’s called cancer, or at the very least, sun burn. You do not want to be strapping on a bungee harness or hoisting your backpack up a mountain trek while covered in red blisters. Make sure your sun block game is strong! Ladies and gents. We all know what happens when young, energetic, passionate, attractive travellers’ eyes meet across a crowded hostel dance floor right? Well, be safe! If you’re going anywhere a little off-the-beaten-path, it’s certainly worth checking in with your doc, just to make sure if you’re in good enough shape for adventure. Make sure you know what medications to take to prevent disease. It’s always worth double checking if you’re unsure. Preventative healthcare is vital. Keep your immune system firing on all cylinders, your energy levels up and your body running like a well-oiled machine. Travelling can be an exhausting undertaking, so if any of your vitamin levels are low, look into trying a safe supplement. The post 39 Essential Tips For Staying Healthy And Happy While Travelling appeared first on Hostelworld Blog.